1. What is included with the rental? Twin Tails Event Farm rental includes use of all the Spaces on our website for the entire day of your event, to also allow use of the property for a photo shoot. Rental of the venue includes many more extras that are detailed on our website under the heading "Services." We strive to be an all-inclusive venue, leaving only a few details to your attention. Catering is contracted with our on site catering company, Magnolia Catering, Co., LLC, outside the rental fee. 2. How do I reserve a date? A date is reserved when a signed contract and deposit is received by Twin Tails Event Farm. 3. What is the rental time for an event? The rental time is from 11:00 a.m. the day of the event. Should you require earlier access all you need to do is request a time. Serving alcohol for the event needs to cease at 11:00 p.m., however you may remain on the property until 12:00 pm. If you require access to the farm the day before for decorating, then all we need to know is the time you are requesting. 4. Can I have the ceremony at the site as well? Twin Tails Event Farm is open for your ceremony, reception, and if you book your rehearsal catering, for 50 or more guest, through us then it is available for your rehearsal dinner as well with no extra charge for the venue, just the additional catering expense. The initial deposit is not refundable. If Renter fails to pay the FULL Rental Fee in full by the Payment Due Date, Owner shall have the right to revoke the agreement and to keep the full amount of ALL Deposits paid to date unless they can re-book the event date for the full rental amount. Renter shall forfeit the entire Rental Fee once paid should they cancel the event date, at any point from the 90-day out date to the event date unless the date can be re-booked for the same date and rental fee amount. The rental fee includes the fee for the use of the Venue spaces as described. Catering is contracted separately through Twin Tails Event Farm's on site catering company, Magnolia Catering Co., LLC. Additionally, you will need to provide event insurance listing Twin Tails Event Farm, Magnolia Catering Co., LLC and Karen & Greg Hineman as loss of liability. 7. Who is responsible for set up and take down of tables and chairs? Our staff provides all set up and take down of chairs as well as the cleaning of the event venue. 8. When can my vendors start setting up the decorations? Vendors can come in as early as two days before the ceremony/event to start their decorating. We just require 24-hour notice so a staff member can be available to open and secure the spaces before and after they are finished. 9. What type of tables and seating is available? Twin Tails Event Farm provides custom, site-built farm tables that will comfortably seat 8 guests with the possibility of 10 guests depending on the layout you request for table arrangement. We also provide white washed, wood cross back farm chairs for the ceremony and reception. Seating for the outdoor "Clearing" is bench seating constructed from timber that was located on property. 10. Are table linens provided? Our tables are not your ordinary banquet tables that require table linens. They are site-built, custom farm tables that may be enhanced using the provided selection of linen or burlap table runners. We do not suggest covering these stunning tables with linens. If you do option for linens, they may be rented through a local vendor at an additional charge. 11. Are engagement and bridal photo shoot access an additional fee? Time for engagement/bridal shoots are included in your rental of the venue. You will need to provide your own photographer and reserve a time to ensure that the shoot does not interfere with any other events. 12. How many guests can Twin Tails Event Farm accommodate? Maximum occupancy within in the Traditional Bank Barn and The Celebration Pavillion is set at 199 for each building per fire code. The Celebration Pavilion has The Veranda which is 1000 square feet of covered outdoor space, spilling out from The Celebration Pavilion, that will afford additional seating. 13. Can we choose our own caterer? Twin Tails Event Farm has a full commercial kitchen, certified and licensed from the State of Maryland for Magnolia Catering Co., LLC. Our vast experience in the food and beverage industry affords us a unique opportunity to orchestrate your entire event from start to finish, therefore we do not offer outside catering companies or "pot luck" dinners. That way we can maintain the integrity of our services and reputation. 14. Do you have restrooms? Yes. We have two located in the Milking Parlor of the Traditional Bank Barn that are ADA accessible, as well as one in The Celebration Pavilion. 15. Are all your sites ADA accessible? All "Spaces" are ADA accessible with ground level entry. 16. Where is the ceremony if it rains? Twin Tails' main goal is to make sure that no bride and groom are disappointed in their special day due to inclement weather. We have spared no expense to ensure that our Celebration Pavilion is an alternative indoor space that will accommodate your guests. Located in its own 2000 square foot building, with a loft area and The Veranda for additional seating capacity, everyone...including the VIPs of the day, you and your partner, will not feel short changed in having to rearrange the ceremony location. 17. Can I tour without an appointment? You must have an appointment to visit the farm. Please see our Contact Us page to schedule your personal tour. 18. Do you provide alcohol? Twin Tails Event Farm is not licensed to provide alcohol. However, you may provide your alcohol through a local vendor. 19. Do we need a bartender? If you wish to have bar drinks, then you will be required to contract with our Magnolia Catering Co., LLC for your bartender. 20. Do you provide music and/or a DJ? No. We do however have a list of vendors from the local area that we can provide to you. 21. How accessible to lodging are you? Our farm is 10 minutes from Deep Creek Lake, 7 miles outside of downtown Oakland in iconic Pleasant Valley, along Maryland’s Scenic Highway. We can provide a list or local lodging facilities for you to inquire about their availability. 22. Are week day events discounted? No. The rental fee is the same for whatever day of the week you choose to rent our farm. 23. Are there any restrictions on decorations I can use? 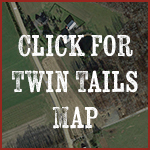 Twin Tails Event Farm does not allow any tacks, nails, glue or staples on the walls or wood. We also do not allow open flames in any of the buildings and any votive candles must be approved by Twin Tails Staff in advance. 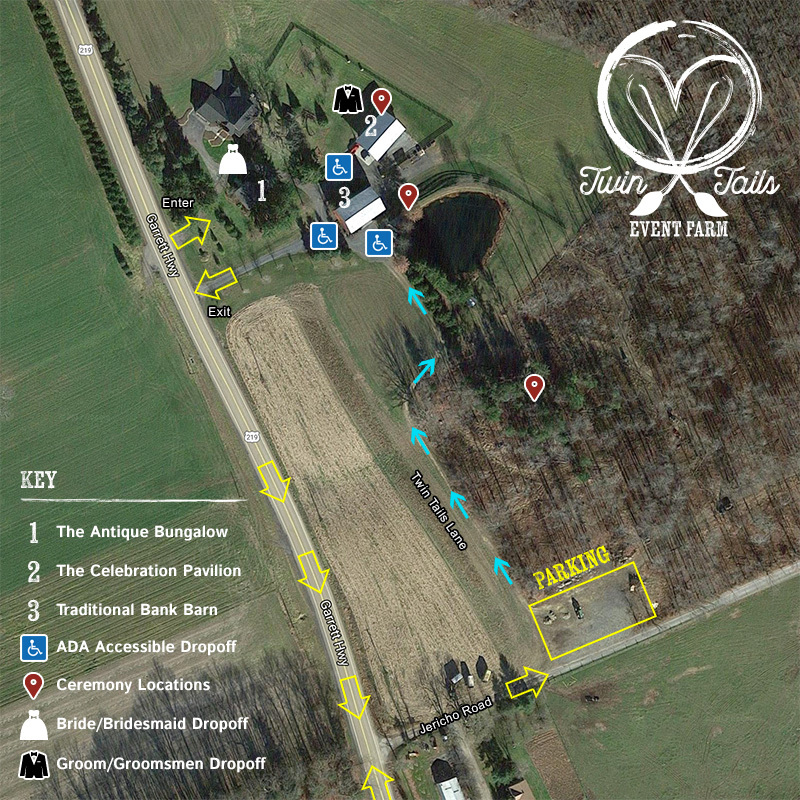 When visiting Twin Tails Event Farm for a wedding/event we have a designated parking area on Jericho Road off Garrett Highway (US-219). There are three accessible ADA drop off locations as notated on the map. When dropping off any guest due to ADA reasons or inclement weather please enter at the entrance drive and then exit and turn to your left. Jericho Road will be your next left. If at any time you are the designated driver and are unable to walk down our lovely Twin Tails Lane, you can notify us and we will be happy to send our brand new 4 seater ATV (Gator) to pick you up and bring you down to the ceremony site.